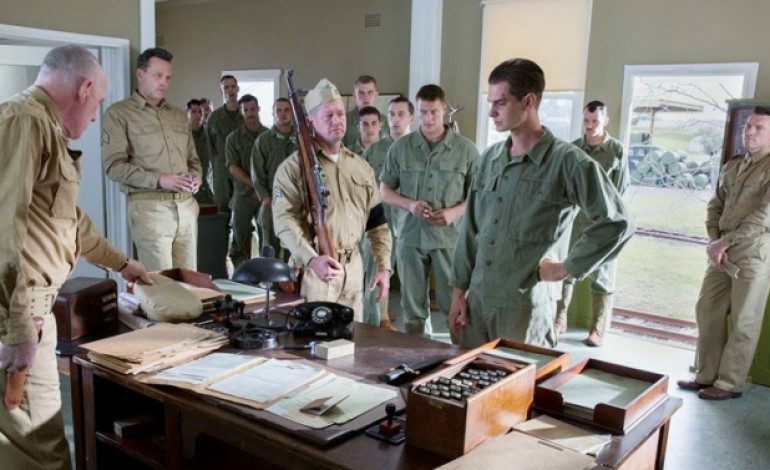 The first still from the set of the World War II film Hacksaw Ridge has been released. The film is being directed by Oscar winning director Mel Gibson (Bravheart, The Passion of the Christ) and stars Andrew Garfield (The Amazing Spider-Man). Garfield plays conscientious objector, Desmond T. Doss, a medic who saved 75 men during the bloody WWII battle in Okinawa without firing a gun. Vince Vaughn, who has recently been involved in more serious work in the latest season of True Detective and the upcoming crime thriller Term Life, is set to play a sergeant whose job is to whip soldiers into shape. The star of James Cameron’s Avatar, Sam Worthington, will play the officer in charge of the unit.The cast also includes Luke Bracey (The November Man), Teresa Palmer (Warm Bodies) and Rachel Griffiths (ABC’s Brothers & Sisters). Gibson’s son, Milo Gibson, will also will also have a role in the film. The script was written by Robert Schenkkan, Andrew Knight and Braveheart screenwriter Randall Wallace. Hawksaw Ridge is being produced by Pandemonium Films and Permut Presentations along with Bruce Davie and Paul Currie. The executive producer is James M. Vernon. The film will be distributed in 2016 in the U.S. by Lionsgate/Summit, Icon Film Distribution in Australia and and international sales are being handled by IM Global.